I don’t know about you, but I need a solid breakfast or my whole day goes off-track. I don’t always have time to make the kind of meal I need, so if I’m facing a busy week, I try to plan ahead. 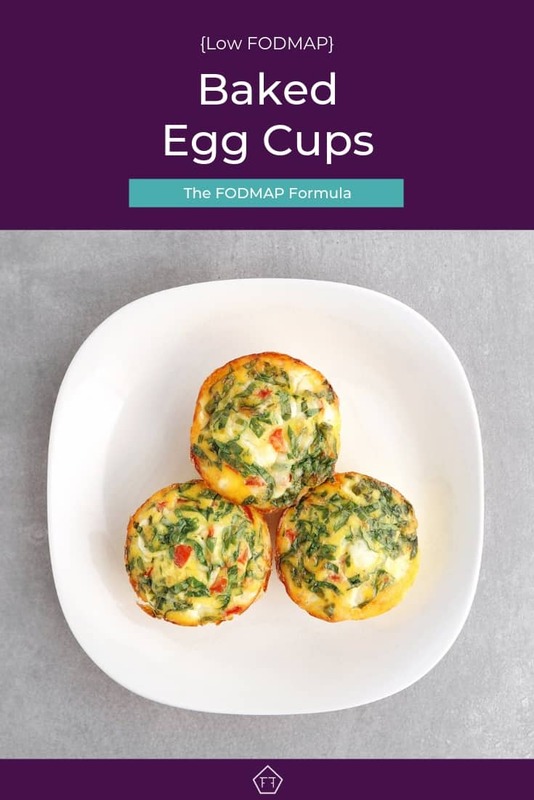 One of my go-to breakfast recipes are these low FODMAP egg cups. These baked egg cups are awesome! I can make them in bulk on Sunday morning and have a stress-free breakfast all week long. If you get tired of eating the same thing every day, don’t worry. You can make different flavour combinations in the same batch. This can add some variety without any extra work. 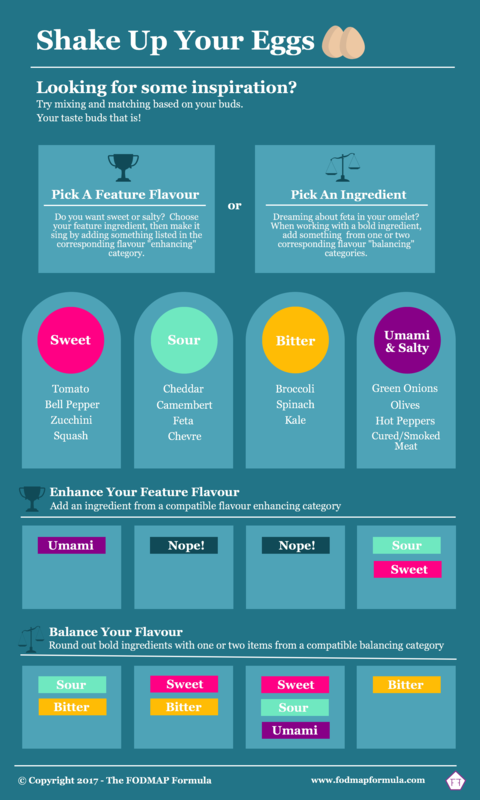 If you need some fun flavour combinations to get you started, check out the infographic below. Think this sounds great, but you don’t have time to try it now? Don’t worry. You can PIN THIS POST for later. Because eggs are a protein, they don’t have any FODMAPs. However, some people still have trouble digesting eggs on their own. I have trouble with eggs too, so I normally use one egg per serving. I also try to eat my egg cups with a piece of toast or some fruit. If you don’t have an issue with protein, you can use two eggs per serving. 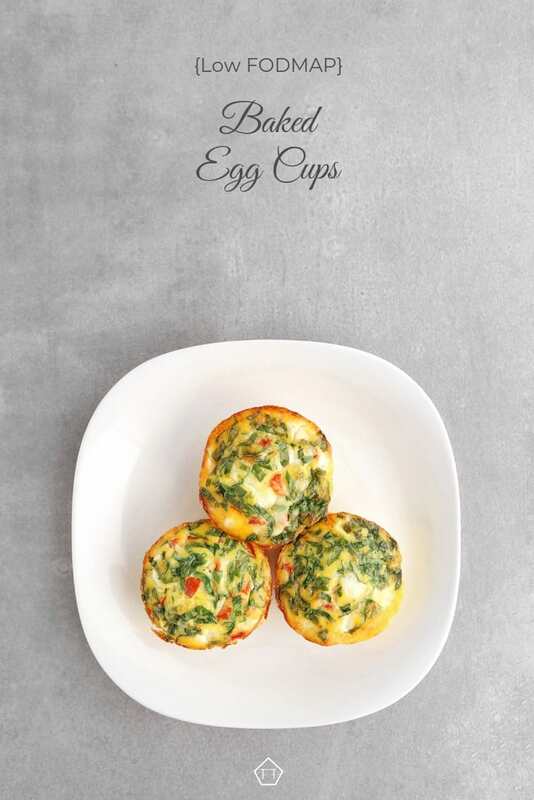 When you’re picking the ingredients for your baked egg cups, make sure you check the portion sizes in your Monash app. Other than that, be creative and tag me on Instagram (@fodmapformula) with your creations. Looking for a FODMAP friendly breakfast idea? Try these low FODMAP baked egg cups. Dress them up or down for a protein-packed breakfast you can make in advance. Spray muffin wells with cooking spray and crack one egg into each well. Add 1 tbs of milk to each well and stir gently. Add additional ingredients (the ones suggested, or ones you like). Bake eggs for 12-30 minutes depending on your oven and how firm you like your eggs. This recipe is for one egg cup. If you only need one serving, you can cook it in a ramekin. 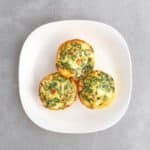 If you're making a batch, put 1-2 eggs in each muffin well. Then add your toppings to each well. 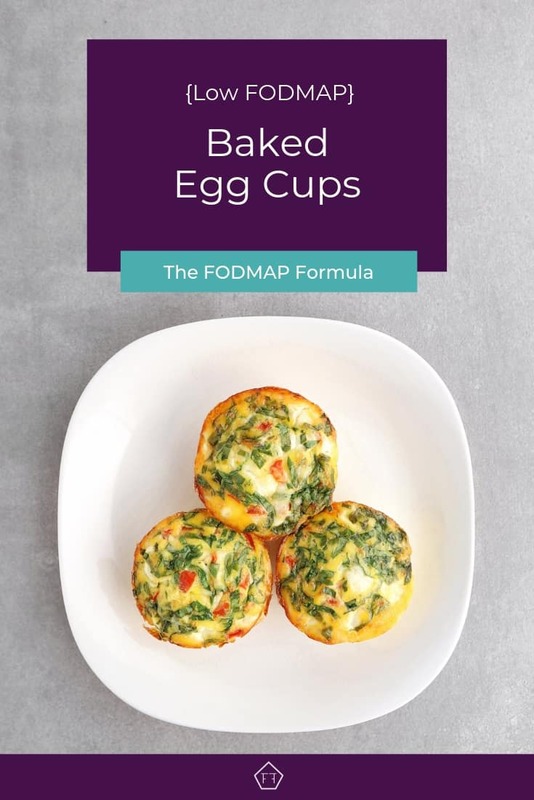 I hope these low FODMAP baked egg cups make your mornings a little easier. If you like this recipe, don’t forget to sign up for my mailing list below. You’ll get new articles and low FODMAP recipes delivered right to your inbox. You can also follow me on Pinterest for even more low FODMAP breakfast ideas. Together we’ll get the Low FODMAP Diet down to a science! Lovely recipe, appears to be something my body could digest normally. Since I’ve experienced a life altering ruptured brain aneurysm wuth 23 hour brain surgery, craniotomy and life long rehab I am having difficulty converting this recipe. Would you send me recipe for either 6 or 12 servings? Thank you very much. Blessings to you. To make 6 servings, use 6 eggs, 6 cherry tomatoes, 3 tbsp crumbled feta, and 12 medium-sized spinach leaves. 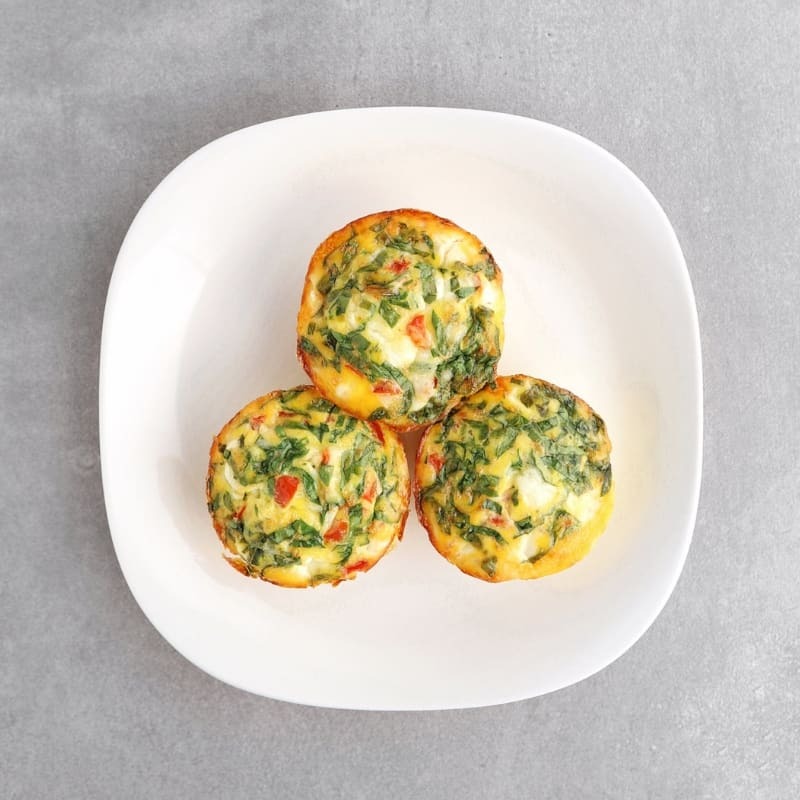 For 12 servings, use 12 eggs, 12 cherry tomatoes, 6 tbsp crumbled feta, and a handful of spinach leaves. Hi Amy, Thanks for sharing! probably will add this to my low fodmap breakfast list. Hi, doppelgänger! These will make a great addition to your breakfast list. If you throw in some ham or ground beef, you’d have a pretty spiffy lunch, too.